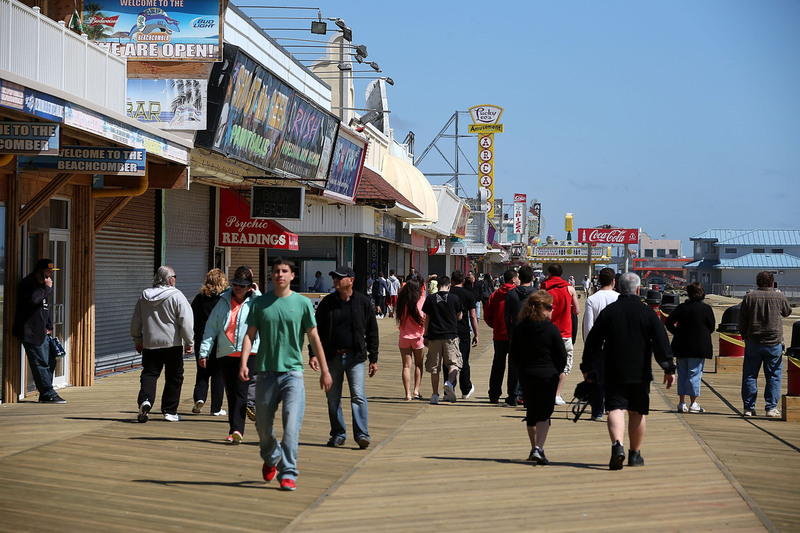 Bodies On The Boardwalk: Murder Stirs A Sleepy Jersey Shore When he was a kid, writer Chris Grabenstein loved tourist towns, so he set novels in one of his favorites — the Jersey shore. He says one of the great joys of writing is coming up with an interesting place to drop the body, like a roller coaster or a tilt-a-whirl. 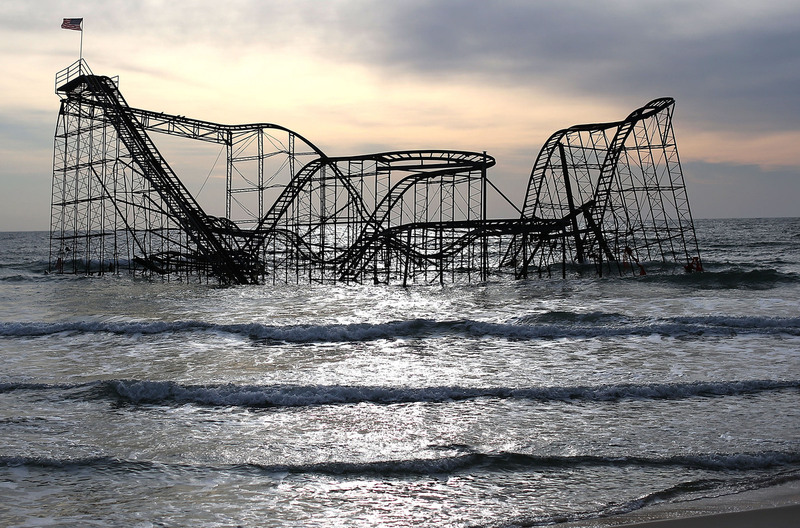 The Jersey shore's iconic Star Jet roller coaster was inundated after Superstorm Sandy. 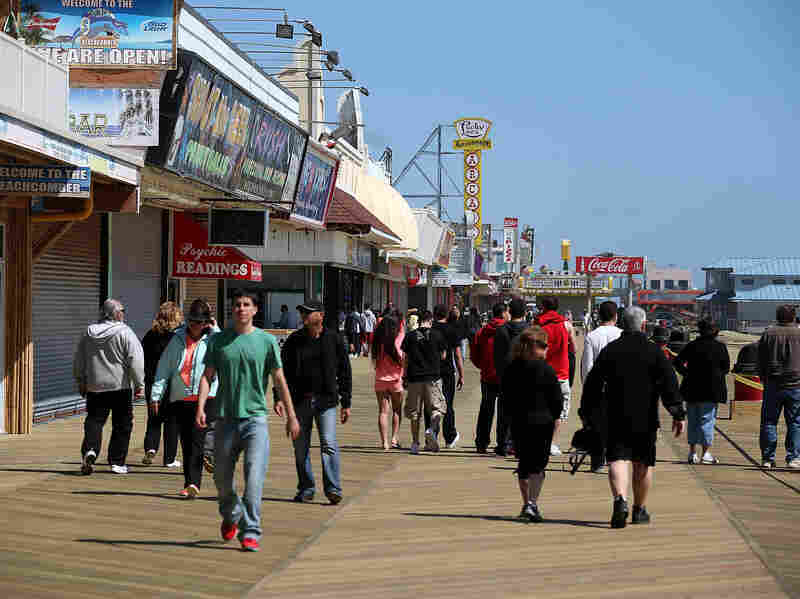 When writer Chris Grabenstein plots his mysteries, the murders happen in the corny nooks of New Jersey's Jersey shore. After all, there's something delightfully cheesy about a beach town. "I guess I'm a cheesy guy. I like this kind of stuff," Grabenstein says. "Ever since I was a kid I loved tourist towns." The author points out shop names as we walk along his stretch of the shore. There's the Sunglass Menagerie, an ice cream shop called Do Me A Flavor, Shore Good Donuts and How You Brewin' coffee. I'll spare you the rest — Long Beach Island has 18 miles of this stuff. "I actually came up with the title for the first book before anything else, which is Tilt-a-Whirl, because I'm a Bruce Springsteen nut and his song ['4th of July, Asbury Park (Sandy)'], where he sings about 'that tilt-a-whirl down on the south beach drag, I got on it [last night] and my shirt got caught' was just in my head and I thought 'tilt-a-whirl' would be a great name for a mystery. And I could do a whole series and each one would be named after an amusement park ride." There's Mad Mouse, Whack A Mole, Rolling Thunder. Grabenstein changed the name of this little town to Sea Haven, but he still needed a detective. Amusement park rides like this one, on New Jersey's Point Pleasant Beach, inspired Grabenstein's book titles. "I wanted to do the opposite of all the heroes I loved in other murder mysteries," he says. "You know, the hard-boiled guy, he used to be a cop then his partner got shot. He always has like a bottle in his drawer. So I thought, what if I did the exact opposite and created almost an overgrown Eagle Boy Scout, a Dudley Do-Right, a guy who will not lie, cheat or steal or tolerate those who do." The result is Detective John Ceepak, a former Army military police officer who took a cushy job as a beach cop to recover from serving in Iraq. And, well, you can guess that he never quite gets the chance to relax. Ceepak is sitting in this very booth in Fred's Diner — or, Pancake Palace — in the first book, when he spots a young woman covered in blood stumbling from the amusement park just up the street. 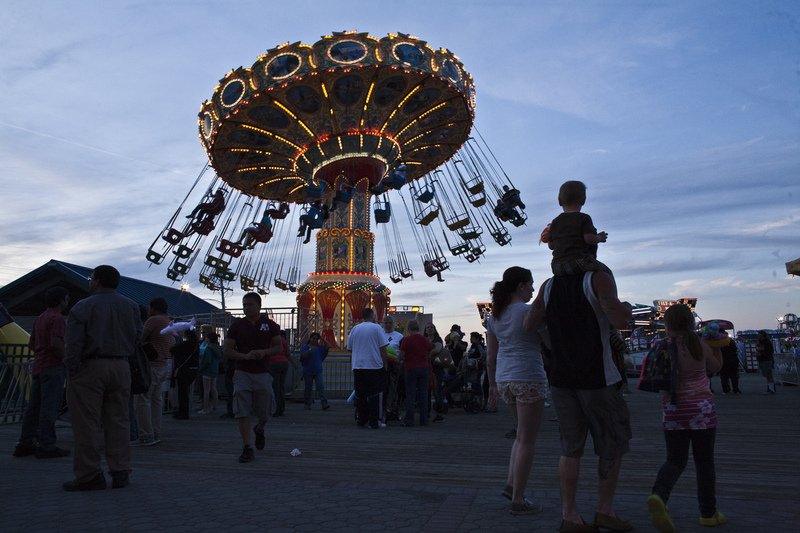 Our next stop is Fantasy Island, one of those tiny, blink-and-you-miss amusement parks scattered along Long Beach Island. "They're terrific," Grabenstein says, "and there's almost every ride. Like that one over there will drop you down like a free fall. Over there we've got a tilt-a-whirl." In Grabenstein's Tilt-a-Whirl, that stumbling young woman's father was found slumped in one of the ride's turtle-shaped cars. The author delights in finding innocuous places to shove a body. "That is always one of the great joys, if you will, of writing a murder mystery, is coming up with an interesting place to drop the body," he says. "I had one take place on a roller coaster in the middle of a ride and that was a lot of fun to think about." In Grabenstein's book Fun House, Detective John Ceepak goes up against the rowdy cast of a reality show near the Seaside Heights boardwalk. Grabenstein's mysteries — all eight of them so far — have a dark sense of humor. In his most gruesome book, Whack A Mole, a serial killer buries human heads out on the beach just a couple of blocks from here. The body parts are discovered during a sand castle competition, pretty much right below where George and Maddy Fantry are sprawled out on the sand. The Fantrys live across the bay and they only remember one real murder in the past couple of years. "We've been here a long time," Maddy says. "People are on vacation and everyone's happy when they are on vacation, you know, they leave their attitudes at home," George says. Grabenstein plays with that stereotype by punctuating the calm, sleepy setting with the occasional serial killer. He couldn't predict when he started writing that reality would get even crazier. Two disasters were about to hit the shore: Superstorm Sandy and Snooki, one of the cast members of the MTV reality show Jersey Shore. The show hit the beach like a tsunami and Grabenstein couldn't ignore it, so he wrote it into his seventh Ceepak mystery, Fun House. He takes me to 1209 Ocean Terrace, the notorious Seaside Heights home of the Jersey Shore gang. This is where they filmed the reality show, and when we arrive we find that even though the show is off the air, people still line up to tour the house. In Fun House, Grabenstein pits Ceepak against a rowdy group of drunks in a similar reality show. ("They just rub him the wrong way," the author says.) The show's producers figure out that the more trouble the cast gets into, the higher the ratings, which is true in real life too. But in the book, the high jinks escalate to murder. Grabenstein takes me to the last icon from his books, or at least where the icon used to be. We pass the corn dog stand, the paintball parlor, and come to a big gap covered by a chain-link fence. "At the end of that pier over there was a roller coaster which was like a mad mouse or a wild mouse, depending on where you grew up. A tight-turn roller coaster," Grabenstein says. "And this one was cool because it took you out — you were out over the ocean." It was the inspiration for his second mystery, Mad Mouse. 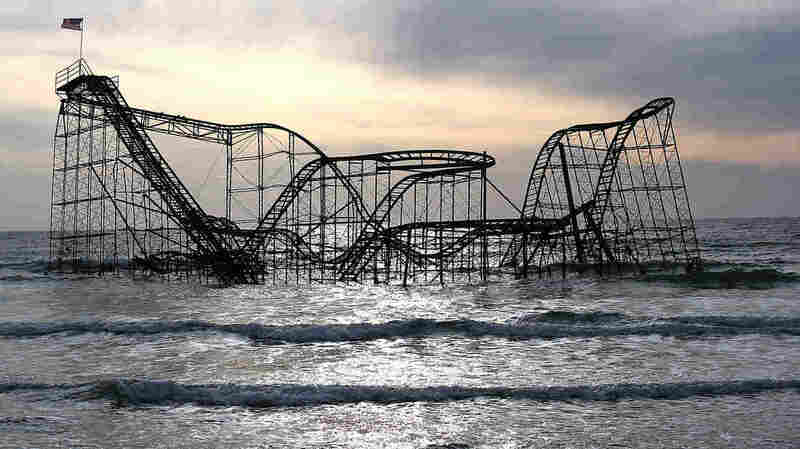 After Superstorm Sandy hit, Grabenstein saw his beloved coaster on the front page of The New York Times. The pier was destroyed. And his mad mouse? 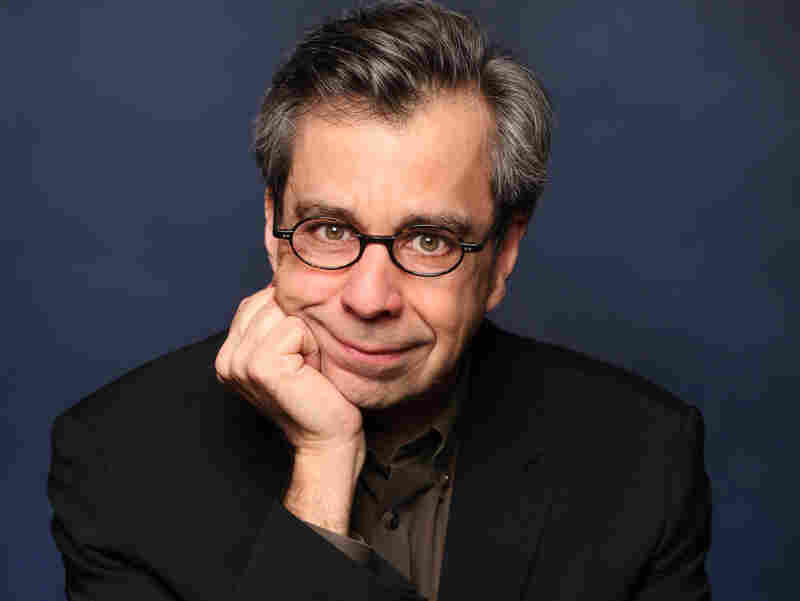 Chris Grabenstein's writing talent was first discovered by his former advertising colleague, the best-selling author James Patterson. "It was this tangled wreckage," he says. "Almost like a carcass out in the middle of the ocean. It was pretty horrible." On this sunny, summer day, the pier is a construction site, but a few rides are up and running. The rest of the boardwalk is up and running. Maybe not crowded, but surviving. They sell little bits of the storm-damaged wood in the souvenir shops. Grabenstein says it's made him rethink some things in his books. Readers want to come back to the same place over and over again, just like tourists. "I think the attraction of shore towns is that everything is the same," he says. 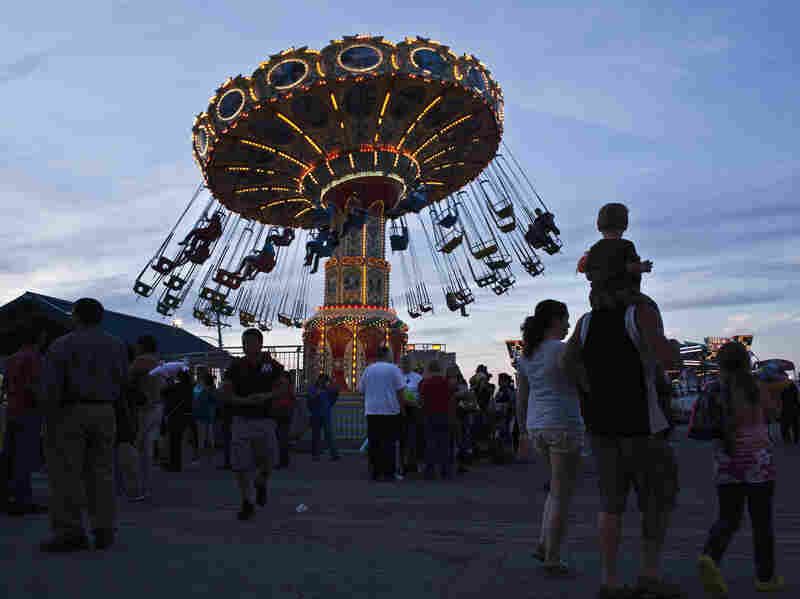 "You know, the rides are there that you remember as a kid, and you grow up and you bring your kids. And I think that was what was so devastating about Sandy — it wiped out all those memories and that sense of permanence. This whole thing is built on sand and there can't be anything permanent about a shore town." His latest book, Free Fall, was at the publisher when Sandy hit, so he was only able to slip in a few lines about the storm. His narrator says that John Ceepak pulled the town through Sandy, and promised to tell that story in the next book.